I’m an intensely private person with a stubborn exhibitionist streak. I want people to know some of my deepest desires and talents but only after I’ve carefully packaged and presented them. Okay, you caught me – I’m a bit of a control freak. Plus I’m inconsistent. I’ll share too much in one situation and then back off in another. It all depends on how I’m feeling. Or the weather. All of this is to say that I don’t like blogging about my kids. I want to protect their privacy and, since we are a transracial family, I am extra cautious about how I present our family to the world. My kids will face enough racism in their lives; I’m not going to add to it by plastering their pictures all over social media for strangers to comment on us. There are lots of things I want for my kids. In the language of metta meditation, I want them to be happy, healthy, safe, and live with ease. I want them to be comfortable with themselves and their world. I want them to have a positive, strong sense of their own identities, including what it means for them to be persons of color. Cue me flipping through kids programming on TV or looking at movie previews or browsing books online or in the library. There are a lot of white (male) protagonists. I find books (and a few TV shows and a few movies) with kids of color, but they are few and far between. 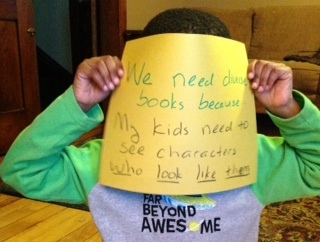 My kids need to see characters that look like them because they need to know that they are a part of the story. They are main characters in their own lives, but the publishing industry doesn’t necessarily reflect this concept. My kids are growing up in a world where white is the norm and they are the exceptions. I will teach them about white privilege and continue to explore my own. We will continue discussing concepts of power, norms, identities and race. 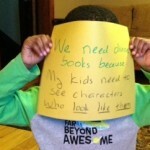 But it sure would help if they could see themselves and their experiences reflected so much more in the books they read. This is why I need diverse books.